Cast members show love for Harriet Tubman, March 24. Bronx, N.Y. — For the second week in a row, a local stage production in commemoration of the centennial death of African-American freedom fighter Harriet Tubman was presented, this time in the Bronx, N.Y., on March 24 at the Bronx Art Space. African-American students and faculty members at Boys and Girls High School in Brooklyn, N.Y., performed a play in tribute to both Harriet Tubman and civil rights activist Rosa Parks on March 16. 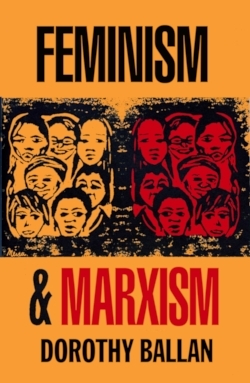 The Bronx production was sponsored by Women Workers for Peace and the Taller Experimental de Arte, which is composed of members of the Latina community and activists representing various countries throughout Latin America and the Caribbean. Both the Bronx and Brooklyn plays were organized in March, which is recognized in the U.S. as International Working Women’s Month. The play, entitled “Harriet Tubman’s Tracks: A Slave’s Audacious Bid for Freedom,” was written and directed by Graciela Muñoz-Bejarano. She also summarized the 10 acts of the play in both English and Spanish as the “Voice of History.” Beautiful artwork depicting Tubman decorated the walls of the space provided by artist Virginia Ayress. Zoila Ramírez and other actors designed the authentic clothing. Nieves Ayress was the coordinator of the production. The moving as well as educational production covered virtually every important aspect of Tubman’s life, including her birth into slavery; the unspeakable atrocities she suffered at the hands of the slavemaster; her escape to freedom in the North; her role in freeing hundreds of enslaved people as an Underground Railroad operative, which led to her close collaboration with abolitionist John Brown; how she became a Union spy during the Civil War; and her contribution to the struggle for women’s rights. Before Tubman died on March 10, 1913, she opened up a home in Auburn, N.Y., for indigent, elderly Black people. 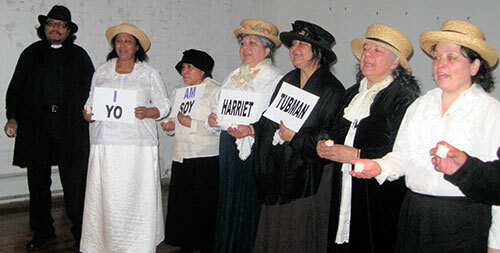 Each one of the actors who portrayed Tubman throughout the various acts brought her own unique exuberance and spirit. The program held the entire audience in raptured attention for more than an hour. The audiovisual engineer, Enrique Eboli-Muñoz, showed powerful slides of authentic photos and graphics depicting enslaved and freed people of African descent, including Tubman herself, during the production. Following the play, some of the actors, along with other activists, spoke on how Tubman’s life impacted them personally and what her legacy means for the ongoing struggle for social justice today, including the demand for reparations and an end to police brutality.